Anyone who's anyone (and many more who aren’t) has written something this week about "Capital in the 21st Century," the new treatise on income inequality by French economist Thomas Piketty. The book was actually published early last month by Harvard University Press, but arrived to fanfare only within the insular, if august, community of economic policy researchers. So, on arrival, it might have seemed like the 700-page tome, with its academic tone and laboriously documented historical analyses, was destined to a life of obscurity. But then something strange happened. People -- regular people -- started to buy it in droves. By the time "Capital" surged to the top of the charts this week -- so many physical copies of the book were sold that Amazon actually ran out of inventory -- Thomas Piketty had become the most famous economist this side of Paul Krugman, celebrated on the left and reviled on the right. At this point, a review or discussion of "Capital" is almost a rite of passage for an aspiring wonk. (You can read this writer’s here.) But the one question that hangs over Piketty's meteoric rise is, in a way, the most obvious one: What does any of this actually mean? First off, Piketty is a symbol of the increasing consensus among academic economists and political scientists about inequality and democracy. This consensus, which has been demonstrated in innumerable studies, reports and books already, establishes a few propositions: Inequality has been increasing in the United States over the past three decades. 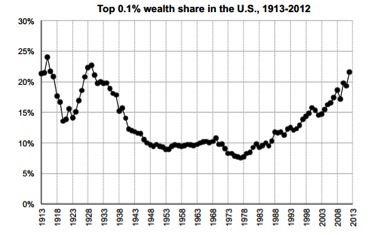 This inequality has been defined particularly by an explosion among the very top, be it the 1 percent or the 0.1 percent (or even the .01 percent). This concentration of economic power has coincided with an increase in political power for the wealthiest Americans. There are still some ideologues who dispute these points, but there are ideologues who still dispute evolution and global warming -- best to move along. Second, Piketty puts conservatives in a rather awkward position. Conservative values, like "opportunity," "family" and "tradition" -- which are broadly supported by Americans -- were once the backbone of the Republican Party. Today, that tradition has been jettisoned by the GOP in favor of becoming a subservient vessel for the richest of the rich. Some conservatives have argued that inequality isn’t a problem because government transfer programs -- Social Security, Medicaid, Medicare -- reduce inequality. This is certainly true, but these are the same transfer programs conservatives are so eager to cut! So if conservatives wish to make this argument, they must implicitly accept that transfer programs work to alleviate inequality, and therefore that cutting them will increase inequality. Other conservatives, like Kevin Hassett at the American Enterprise Institute, have argued that the increase in income inequality has not led to increase in consumption inequality. That is, while incomes have diverged, because the wealthy save more, the poor and middle class can still afford to keep up in purchasing consumer goods. This isn’t true: Numerous studies find that consumption inequality has increased along with inequality. However, if the poor have been able to buy goods, they are only able to do so by increasing their debt-loads, which means that wealth inequality will increase concomitantly. (There was a day when conservatives would fear an increase in debt and a large propertyless class. Today, they cheer it on!) In both of the aforementioned conservative arguments, the right reveals the depths to which it will happily sink to gain the patronage of the wealthy. Third, Piketty points us again to the most important facet of inequality -- the inequality of capital. Capital -- the ownership of assets that allows individuals to attain wealth and exploit labor -- was what Marx worried about. As he wrote in "The Communist Manifesto" of the members of bourgeois society: "Those of its member who work, acquire nothing, and those who acquire anything, do not work.” Today, the debate over income inequality is framed often as the distinction between the salaries of mega-CEOs and minimum-wage workers. This inequality is certainly disturbing; a recent Demos report finds that the compensation of fast food CEOs was more than 1,200 times the earnings of the average fast food worker. But salary is only one part of compensation. 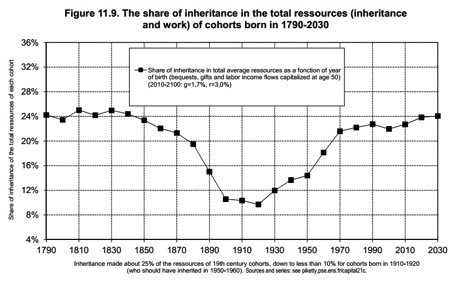 Piketty reminds us that a far more potent driver of inequality is the passive accumulation of capital that is only exacerbated through inheritance (see chart below, from Piketty). This distinction is important, because it reveals the true depth of Republican hypocrisy. While they talk of the value of hard work, they cut taxes on the various parasites whose only source of wealth is the labor of others. They wish to reduce income taxes to 25 percent and, more disturbingly, eliminate capital-gains taxes altogether. That means more wealth inequality, because the percentage of Americans who owns stocks is decreasing (and capital is even more unequally distributed than labor). When their policies are examined objectively, they help not even the 1 percent, but a much smaller portion of society -- the 0.01 percent that make their money through capital accumulation and exploitation, rather than of honest labor. Is Piketty’s book more likely to be purchased and sat on a coffee table than read? Certainly. The same can be said of "Das Kapital," though no one would attempt to deny its immense political impact. Keynes' "General Theory of Employment" -- the ur-text of modern economic policy -- also wasn't widely read by the masses, but no book has had a more potent or prolonged influence on the world economic program. The idea of a dense, academic tome setting the public alight is not extraordinary, but rather quite ordinary. The list can certainly be expanded. It’s unlikely that public fully understood the "Origin of the Species," the Pentagon Papers, "Silent Spring," "The Kinsey Report," "Democracy and Education" or "The Course of Positive Philosophy" at the time of their publications, but their impact on society, because of the movements they either fomented or supplemented, is undeniable. "Capital in the 21st Century" is such a book. For decades, Americans have been aware of the fact that “growth” was no longer benefiting them and their children. We have noticed that the benefits of new technology and of our labor have been flowing to a very few, and that those same people then dictate policies to consolidate their wealth even further. Our voices are not heard, as both political parties, to differing extents, have become subservient to those with wealth. If nothing else, "Capital" will finally bring questions of “who gets what” back to the center of economics. Economists will no longer be able to couch tax cuts for the rich behind a veil of jargon, disguising power relations as mere economic efficiencies. We forget, if we ever knew, that the earliest economists were philosophers and historians first -- and that economics was always considered to be a question of politics. Piketty supplies us with the basis for a new narrative. In this narrative, the postwar period -- in which rapid growth produced broad-based, equally shared growth -- is unique, not an inevitable product of capitalism. Piketty believes this postwar lull in violent inequality to be an inevitable coalescence of population and war. I believe it was brought about by a powerful labor movement and an epochal crisis of capitalism, coupled with wartime solidarity. Either way, such equality will not come again without action (and it’s unlikely we could grow our way to equality). Money will not remove itself from politics. Power cedes nothing without demand.